Our Printed Barrier Tape prices are available online by using our 10 second quote tool. Press the button below to generate your Printed Barrier Tape quote. Ordering online is easy & we accept all major credit cards. If a quantity or specific width of Barrier Tape is not shown, you can always contact us via phone, email or our live chat service. Dimensions: Please select the Width & Length of the Barrier Tape you require. 75 mm x 250 m This is our standard Barrier Tape size. 75 mm Wide x 250 m in Length. 50 mm x 250 m This size is most commonly used by the Police. 50 mm Wide x 250 m in Length. Material Colour: Please select the background colour for your Barrier Tape. 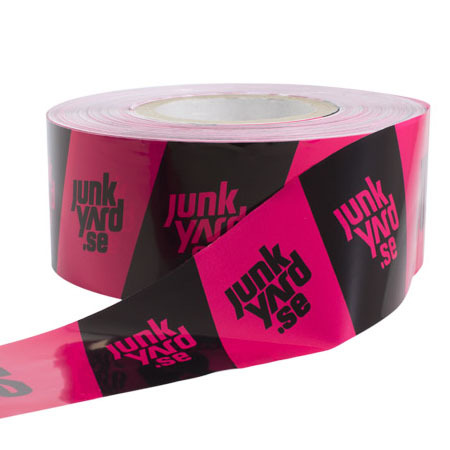 We can personalise your barrier tape with your logo, business details in up to 3 colours. Our Barrier Tapes are suitable for indoor and outdoor event use, in any weather. What are the sizes of Barrier Tape? The standard reference when it comes to barrier tape sizes is width and length. In thickness, all tape sizes match. When buying barrier tape, you must consider the size of the area that you want to cordon off. Larger perimeters will certainly require longer tapes. If you make a mistake and order shorter tapes, you will end up joining several tapes at the terminals to cover the perimeter. On a standard scale, the barrier tape size is 75 mm x 250 m.
However, with customisation, you can have variations in both width and length. The barrier tape used by police to fence off accident and crime scenes measures 50 mm x 250 m on average. Depending on your specifications, you can have tapes measuring 70 mm in width by 500 m in length. Barricade tape is usually a brightly coloured tape that is most commonly used where there is a danger, hazard or to create a divider. For example the police use Blue on White for their barrier tape in England. It creates a barrier hence the name Barrier Tape. The printing can also be tailored for the event or purpose for which it is required. For instance, barrier tape for accident scenes may be printed ‘Crime Scene Do Not Cross’ while tapes for construction sites may be printed ‘Road Works Ahead Do Not Cross’. Part of the functionality of the barrier tape is in its strength. Most of these tapes are made using high strength polythene or polypropylene material. These are plastic materials that are durable and tear-resistant. These barrier tapes serve the same purpose as the printed barrier tapes only that they are either monochromatic or poly-chromatic. For instance, you may come across standard barrier tapes with black and yellow or white and read hazard warnings. These barrier tapes are usually pre printed because there is no customisation needed. If you want to block off dangerous areas within your facility to prevent accidents, standard, as opposed to printed barrier tapes, are recommended. The lack of customisation in these tapes makes them slightly cheaper than the customised varieties. The only messages, if any, are general just to catch people’s attention and enhance the visibility of hazards. The materials used in making standard barrier tapes are like those used in printed barrier tapes. This means you enjoy equivalent strength, tear resistance, and durability. What material is Barrier Tape made from? Our Barrier tapes are produced from high strength non adhesive polyethylene (LDPE) in various widths but our most common variations are 75 mm x 250 meters long and 50 mm x 250. We can produce custom printed barrier tapes in up to 3 colours on a number of coloured backgrounds, our most popular colours for standard runs are White, Red, Green, Blue Orange, Yellow and Black however we are not limited to just those colours and can print truly bespoke jobs. (LDPE) This is a very strong material, that also finishes extremely well. What is Printed Barrier Tape? Barrier Tape is non adhesive tape primarily used to separate people from areas, such as Police crime scenes or races including charitable events. It’ is also used as a marketing resource due to its real world use, at charitable events it used to promote sponsors whilst dividing people and giving instructions such as do not cross. The relatively low cost of Barrier Tape means it is also very cost effective when you think of the dual purposes it serves. We can produce custom printed barrier tapes from as little as £15 per roll. Printed Barrier Tape is a non adhesive tape that creates a divide or a barrier most commonly used at races, charity events and by the police. We can produce custom printed barrier tape in many sizes, quantities and colours. This tape is widely known as Barrier tape or Barricade Tape. The minimum order for barrier tape is 12 rolls. (LDPE) Barrier tape is manufactured using a high strength non adhesive polyethylene material. Barricade tape is made with durable tear resistant plastic materials such as nylon, polyethylene or polypropylene. Standard barrier tape is essentially barrier tape that is either plain in colour, one coloured or kept as stock such as the Black and Yellow hazard warning barrier tape, or the red and white . red and black hazard warning barrier tape. We stock these tapes as well as many other pre printed tapes such as caution and danger. We also manufacture Printed Packaging Tape. Contact us to learn more. Get in touch with us today for personalised barricade tape quotes or the answers to any questions you may have.